When I saw this image in the store at Createful Hearts, my own heart just melted. 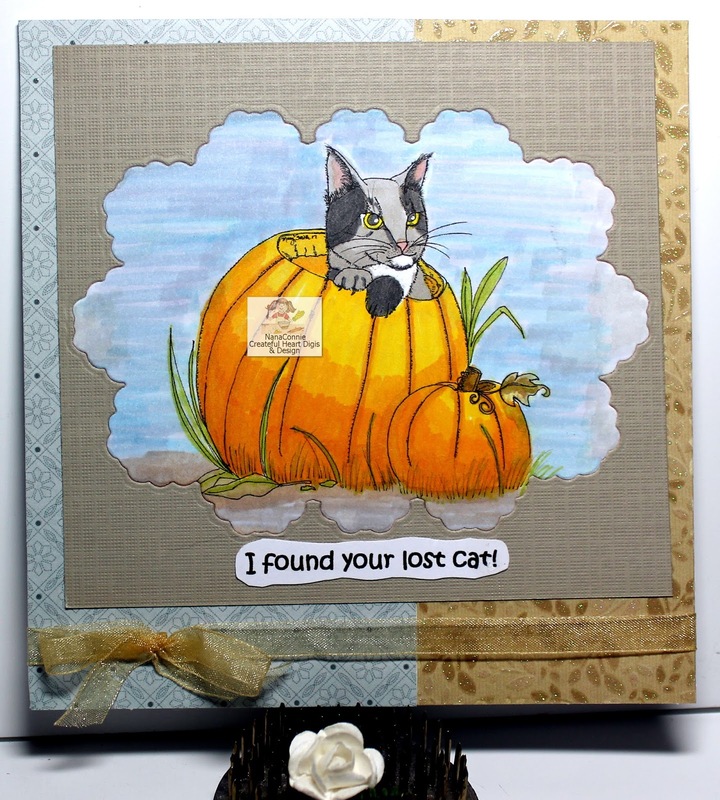 Our newest challenge starts today and this just seemed like a perfect autumn image for my DT card. It's called "Pumpkin Patch Kitty" and I know you're going to love it, too (even if you're not a 'crazy cat lady.') Our theme is "Anything Goes" and you can use whatever image you want to enter. I colored this one with ProMarkers and cut the frame for it with a die from Sue Wilson. In this case, the frame is the negative piece of the cut and it's placed over the image, not the other way round. The two papers for the background are both from the Linen Closet stack (DCWV), one of my absolute favorites of all time because the colors and patterns are just so versatile. The brown one with the tiny leaves is embossed and glittered. I added sheer ribbon and tied it into a bow. Love this! The kitty is so precious poking his head out of the pumpkin. I can just see a little kitty doing this too. Cute card and great use of the negative space. This is gorgeous Connie, love the cut kitty and wonderful papers and dies frame you have used to showcase the image. Awww . . . super cute!! And I love how you've framed it with the negative space of the die; so fun! Thanks for playing with The House That Stamps Built. I AM a crazy cat lady hahahaha :-D Love the sweet kitty and I really like how you used that negative die cut. I hope you will come and play in my Cats only Challenge. The die cut aperture works really well framing your image. That cat is so pretty and I just love the pumpkins!! Great card! Great card, such a cute cat!. Thanks for joining us at The Paper Shelter this week. Awwww, fab image (my kitty likes to hide in things too!) and lovely autumnal colours. AW! how wonderful, I love the image, your colouring the great way the die frames the kitten, all in all, LOVE it.